Muted green with tiny diamond print. 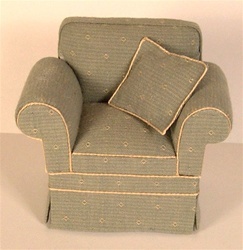 Very Popular - A new elegant upholstered chair in a muted green woven fabric with a very subtle tiny gold diamond shape. The chair has a square back, rolled arms and a simple tailored skirt. One matching throw pillow is included and both chair and pillow are beautifully finished with a gold trim. The feet are wood. A matching sofa is available.